This is the 2017 version of the medium Monopoly coffee cup from McDonalds. It also has Canada's 150th anniversary printed at the top. Each cup comes with two monopoly game pieces. 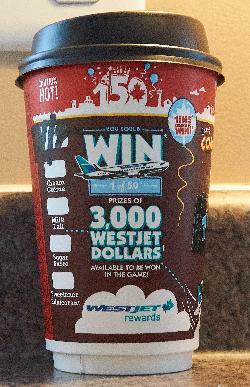 This is the side of the 2017 version of the medium Monopoly coffee cup from McDonalds. It also has Canada's 150th anniversary printed at the top. This side is in English, the opposite side is in French. 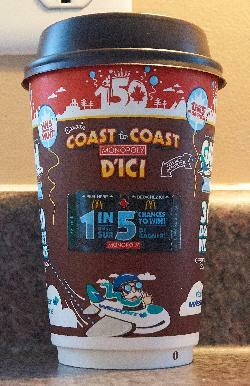 The French side of the Tim Hortons medium coffee cup celebrating Canada's 150th anniversary in 2017. Purchased in Ontario. Contains iconic images of Canada. A photo of the Tim Hortons gift card, which salutes Canada's 150th anniversary. Includes various icons of Canada.